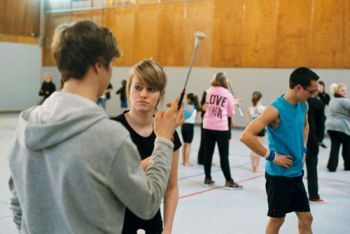 Saturday 19th February 2011, Culture Commune and NoFit State Circus had invited highly skilled groups at the Victor Hugo sports centre, in Béthune’s Mont-Liébaut area. More than 35 young people turned up ! Gymnasts from Jeunesse Béthunoise club, dancers from the Council Dance School as well as the twirling club (les Beffynoises), musicians, circus students all met for a day of sharing and working together with Mish and Orit, artist and Artistic Director of the company. 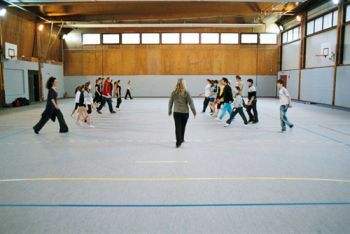 At the end of the day, the young people were encouraged to teach eachother their own moves. Which brought some comical moments, like when this amazing 8 year old gymnast explained a 23 year old lad how to do a walkover without falling ! After a debrief confirming everyone’s commitment to the project, Orit and Mish explained Barricade in details, showing some of their videos from previous projects like Parklife. See you again on 16th and 17th April 2011, for a second intensive weekend, when even more people should join in…before all meet for the big day, on 20th May 2011 for Barricade’s premiere at Z’Arts Up festival !